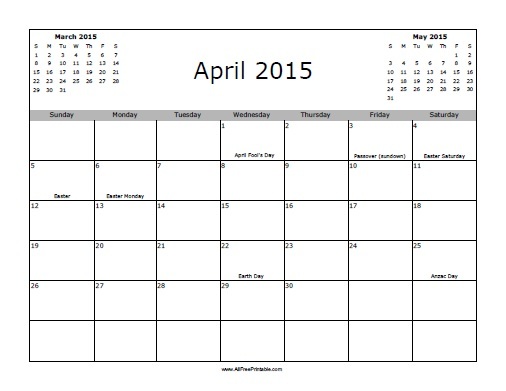 Free Printable April 2015 Calendar with Holidays. Free Printable May 2015 Calendar with U.S. Holidays to use at school, office, classroom and at home. Organize every week of this month and also celebrate April Fool’s Day, Easter Day, Earth Day and Anzac Day in Australia. Is a good idea to have a blank calendar at hand to write down important tasks to do in April 2015. Print your preferred option from calendar starting the week on Monday or Sunday. Use the free printable April 2015 calendar to write important events like sport events, dates, business plans, parades, due dates, birthdays, and things to do everyday day. Use the link below to download or print your free April 2015 Calendar with Holidays.